Payment can be made by Credit Card (Visa or MasterCard only), Wire Transfer or Checks drawn from US Banks. Purchase orders will be accepted from approved organizations. International orders must be paid in full before the products are shipped. All prices are in U.S. dollars (USD). Note: For wire transfers add $25.00 US to cover our additional processing costs. Please click here to download our Terms and Conditions. To order by credit card make a note of the part numbers and prices then use the secure data entry page. This site does not yet support a shopping cart. CNSC02-02 IRIG-B: The CNS Clock II now comes standard with IRIG-B outputs. To get this option, see CNSC02-FW below. Custom configurations are available - please call for information. CNSC02-FW Firmware upgrades and testing for CNS Clock II. Firmware based options that are included in current CNS Clock II units will be activated, even if they were not originally purchased for the unit being upgraded. If hardware failures are found or hardware upgrades are desired, a quote for that additional work will be provided. Note: Software pricing is based on Internet distribution of original software package, updates, and documentation. Quantity discounts available starting at 10 licenses per order - please call. NOTE: antennas are sold only as accessories with CNS Clock II sales or to existing customers. T3000N Timing 3000 Antenna, +25db gain, Double Filter, N-Connector. Includes right angle mounting bracket with U-bolt clamps. Includes TNC(F) to N(M) adaptor. The Timing 3000 is a 100% form, fit, function replacement for the original now discontinued Motorola Timing 2000 GPS Antenna. See also the optional AMNT2, below. NOTE: cable assemblies are sold only as accessories with CNS Clock II sales or to existing customers. The cable assemblies listed below are standard configurations. Custom configurations are available in any length and using a variety of coaxial cable types to fit specific requirements. Please call for information. Standard Low Loss Coax Cable - Loss at GPS L1 frequency is approximately 9db/100ft. Outer diameter .240", micro-cell foam dielectric and type IIIA non-contaminating jacket. Nominal impedance 50 Ohms. Shield is 100% Al mylar & 95% tinned Cu braid. Fire Retardant Coax Cable - same as above but has non-halogen jacket, listed CMR/MPR (PCC-FT4). Extra Low Loss Coax Cable - Loss at GPS L1 frequency is approximately 5db/100ft. Outer diameter .405", micro-cell foam dielectric and type IIIA polyethylene jacket. Nominal impedance 50 Ohms. Shield is 100% Al mylar/95% tinned Cu braid. Adaptor Cables. These cables provide an appropriate interface between the CNS Clock and large low-loss cables, signal splitters, etc. 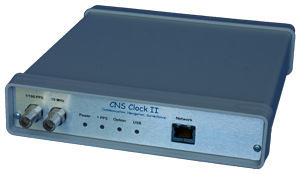 Out of Stock - See CNS Clock II, above. Options, upgrades and repairs are still available. Note: Add 6% Sales Tax if in the state of Maryland. Prices are subject to change without notice. Quotes provided on request. Shipping and Handling will be FOB Severna Park MD. Shipping will be by FedEx 2-Day or UPS Ground unless specified otherwise. International orders will need to contact CNS Systems to get export information and a quote on shipping to your country. Special Orders: The CNS Clock; is highly configurable so special purpose versions can be constructed to meet a customer's particular needs. Likewise, the Tac32 software family can be specially configured to meet specific customer requirements. Call for more information. Information and Orders: Send purchase orders and payments to CNS Systems, Inc., Order Processing, 363 Hawick Court, Severna Park, MD 21146-1409. For credit card orders call (410) 987-7835 or use the secure credit card ordering form. For more information, questions or comments contact Richard M. Hambly at CNS Systems, Inc., Phone: (410) 987-7835, Fax: (410) 987-7836 or use the contct form page to send an e-mail.